The Mamanwa Tribe in this town sees a brighter future now that they are included in the tourism loop of Department of Tourism (DOT). The tribe lives in a small community in Guirang village, one of the jump-off points to Sohoton Cave Natural Bridge National Park, a popular tourist destination in Eastern Visayas. The site regained attention from local and foreign tourists since the provincial government of Samar launched the Spark Samar Campaign last year. The provincial government of Samar and the DOT donated traditional musical instruments called “kimbang and agong” and traditional clothes for Mamanwa tribesmen. Jennifer Cabadungga, 34, the Mamanwa tribe leader said they are happy to feel that they are being treated equally. A total of 21 families or more than 70 individuals are under the watch of Jennifer. She has the highest educational attainment among tribe members after completing high school. As a tribe, they always seek for peaceful place and community, whose dwellers are willing to accept them and help them grow, according to Cabadungga. “We are thankful that there are now agencies helping us so we can be integrated with the community and assist us in our livelihood,” she added. But this assistance should not only stop in providing them skills training, but also equipment, materials, marketing, and promotion of their products. The Mamanwa tribe makes souvenir items for tourists in Sohoton Cave. Among them is Shirley Calinawan, 35, a mother of five. She makes necklace made out of seeds they call “kabug-kabug” from the “salugay” vine that thrives in the thick forest, about 25 kilometers away from their community. She also makes souvenir pens with body made out of bamboo. She sells the necklace for PHP50.00 while the pen is worth PHP20.00 at the tourism office of Basey. Calinawan recalled that the idea came after she undergo training from Department of Trade and Industry of making garland made out of “tikog” leaves that is a known product of the town. “The training did not only teach us now to make necklace, but it also opened our mind that we could make these things. That we are capable and we have talent to do this kind of products,” she said. The acceptance of the Mamanwa tribe to be included in the tourism loop should be welcomed by the people of Basey and the residents of Guirang village as an opportunity to share and learn their culture and traditions, according to DOT. “We are very happy that the Mamanwa tribe agrees when we asked them if we could include them in our tourism loop for as long as this will follow in accordance to their tribe traditions and culture,” said DOT Regional Director Karina Rosa Tiopes. 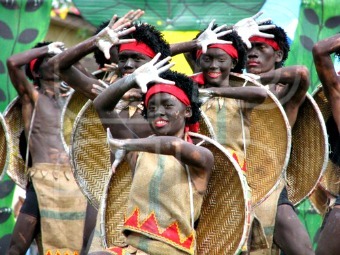 Tiopes urged locals to learn the culture, traditions and history of the tribe for better appreciation of Mamanwa’s presence. “The tourist should learn who the Mamanwas are and know what their cultures are and traditions that need to be respected just like how we wanted to be treated and respected by others,” Tiopes said. For tourism to prosper, one of the most important aspects is learn to mingle and understand the people in the community where tourist attractions are located. “Big business is good but helping the community is more meaningful because this is part of tourism. This is where you see that you touch the lives of people, especially the marginalized communities,” Tiopes added. The provincial government of Samar also hopes that tourism arrival in Basey town particularly at the Sohoton Cave will increase more this year with the inclusion of the Mamanwa tribe in the tourism loop. Samar Vice-Governor Stephen James Tan said that based on records from the municipal tourism office, from more than 800 tourist arrivals in 2012, it increased to more than 3,400 in 2015 when the provincial government launched the Spark Samar campaign. Tourism activities around Sohoton Cave have generated PHP1.4 million income last year. Vice Governor Tan added that for this year, Sohoton arrival had already reached more than 4,000 for the first two quarter of this year. They expect to double this within before 2016 ends. “This is a proof that there is change happening in this town and this will not happen without the help of people who believe that with tourism we can go further, achieve our goal of development that will improve condition of lives in every community,” Tan said. The Mamanwa settlers in Basey town came from Surigao province in the late 1950s to avoid armed conflict in their area. The tribe first stayed in Basey town. Later on, they moved to the interior town of San Jose de Buan, also in Samar province, due to armed conflict.